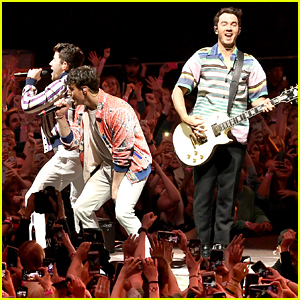 mockingjay Photos, News, and Videos | Just Jared Jr. It was just announced that The Hunger Games: Mockingjay – Part 2 will happen without any interviews this week. Via THR, the cast, which includes Jennifer Lawrence, Liam Hemsworth, Josh Hutcherson, and other stars will not be interviewed on the red carpet by press and will likely greet some fans and take a few photos before heading inside for the screening. This comes after over 120 people were killed in several attacks throughout Paris over the weekend. The Hunger Games: Mockingjay – Part 2 hits theaters on November 20th. New TV Spots & Stills Released For 'The Hunger Games: Mockingjay - Part 2' - Watch Here! 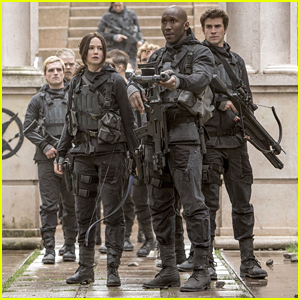 Boggs (Mahershala Ali) scans the area with Katniss (Jennifer Lawrence) and the rebel team in this new still from The Hunger Games: Mockingjay Part 2. In the final film, with the nation of Panem in a full scale war, Katniss confronts President Snow (Donald Sutherland) in the final showdown. Teamed with a group of her closest friends � including Gale (Liam Hemsworth), Finnick (Sam Claflin), and Peeta (Josh Hutcherson), Katniss goes off on a mission with the unit from District 13 as they risk their lives to liberate the citizens of Panem, and stage an assassination attempt on President Snow who has become increasingly obsessed with destroying her. The Hunger Games: Mockingjay Part 2 opens in theaters on November 20th. Willow Shields wows on the black carpet at the premiere of her new film, The Hunger Games: Mockingjay – Part 2 held at CineStar on Wednesday evening (November 4) in Berlin, Germany. The 15-year-old actress joined Jena Malone, Sam Claflin and Natalie Dormer on the press line for the giant cast pic, which also included the big three — Jennifer Lawrence, Josh Hutcherson and Liam Hemsworth. The last film of the franchise, The Hunger Games: Mockingjay – Part 2 will hit theaters on Friday, November 20th. FYI: Willow wore a Marni gown. 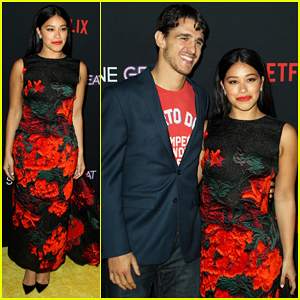 Jena dolled up in Reem Acra. 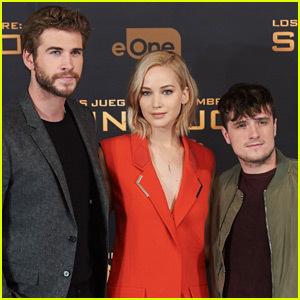 Jennifer Lawrence, Liam Hemsworth, & Josh Hutcherson Are Picture Perfect at 'Hunger Games' Berlin Premiere! Jennifer Lawrence is sandwiched between her co-stars Josh Hutcherson and Liam Hemsworth for the premiere of their movie The Hunger Games: Mockingjay – Part 2 held at CineStar on Wednesday (November 4) in Berlin, Germany. 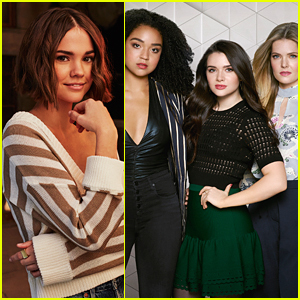 The 25-year-old actress and her co-stars are just beginning their press tour for the fourth movie in the franchise. The Hunger Games: Mockingjay – Part 2 is set to be released on November 20th. Be sure to check it out. FYI: Jennifer is wearing Dior Haute Couture with Neil Lane jewels. Liam is wearing Ermenegildo Zegna. See All The Brand New 'Hunger Games: Mockingjay - Part 2' Pics Here! 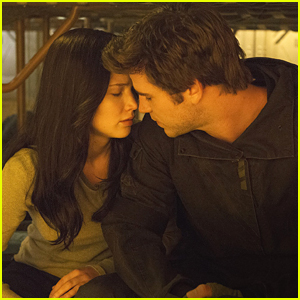 Katniss (Jennifer Lawrence) leans onto Gale’s (Liam Hemsworth) shoulder in this new still from The Hunger Games: Mockingjay � Part 2? Here’s the flick’s official summary: With the nation of Panem in a full scale war, Katniss confronts President Snow (Donald Sutherland) in the final showdown. 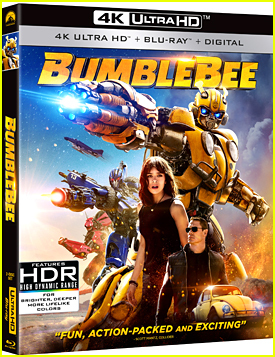 Teamed with a group of her closest friends � including Gale, Finnick (Sam Claflin) and Peeta (Josh Hutcherson) � Katniss goes off on a mission with the unit from District 13 as they risk their lives to liberate the citizens of Panem, and stage an assassination attempt on President Snow who has become increasingly obsessed with destroying her. Katniss Raids President Snow's House In New 'Hunger Games: Mockingjay Part 2' Clip - Watch Here! 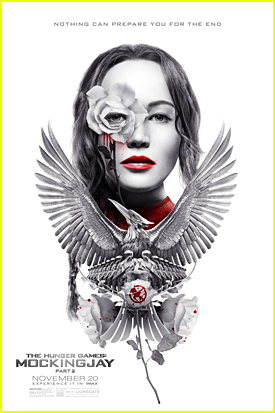 How cool is the new IMAX poster for The Hunger Games: Mockingjay � Part 2? With the nation of Panem in a full scale war, Katniss (Jennifer Lawrence) confronts President Snow (Donald Sutherland) in the final showdown. Teamed with a group of her closest friends � including Gale (Liam Hemsworth), Finnick (Sam Claflin) and Peeta (Josh Hutcherson) � Katniss goes off on a mission with the unit from District 13 as they risk their lives to liberate the citizens of Panem, and stage an assassination attempt on President Snow who has become increasingly obsessed with destroying her. Watch the brand new clip, and see our Mockingjay poster gallery below! The Hunger Games: Mockingjay � Part 2 opens on Friday, November 20th.